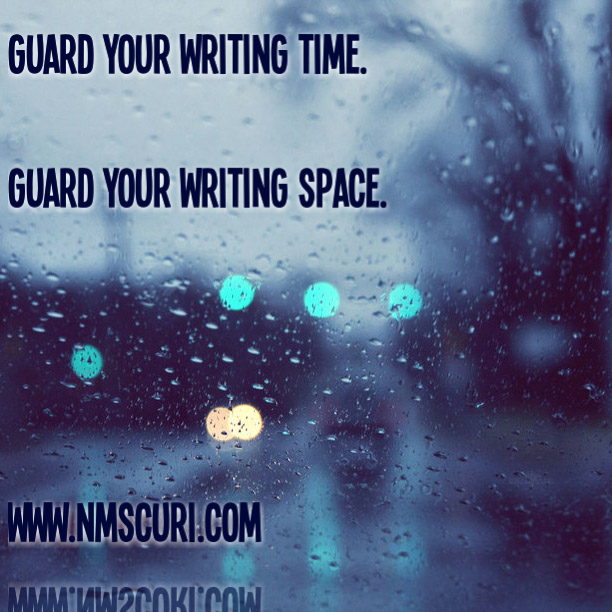 It's easy, especially when someone is starting a writing career, to feel unsettled. This is especially true if the person is coming from a traditional education or corporate system where time is accounted for and performance is more or less measurable. The good news is that a writer can set up shop pretty much anywhere and write anytime. The bad news is that a writer can set up shop pretty much anywhere and write anytime. This can lead to feeling overwhelmed, resulting in the endless investment of books, workshops, software, and knickknacks for that "special" writing space. Conversely, notes, books, and laptop could be shoved away into a corner unused because it's too much trouble to make space on the kitchen table. It can also cause well-meaning friends and family to decide that the writer is free for unannounced visits, unlimited babysitting duty, and errands at all hours. This isn't limited to the unknown or beginning writer. J. K. Rowling famously stated that even though she'd been making a living as a writer for several years, she still had to fight for her writing time. So what can we do? The best advice is to give yourself consistent time and space. Even if it's 30 minutes at the local coffee shop with a notebook three times a week, make an appointment with yourself and stick to it. Start where you are and with what you have. You can always adjust if a different time or space work better, but don't use adjusting as an excuse to procrastinate. Pick as schedule and place and try it for 30 days. Then make one change and try it for another 30 days. Keep going until you find your rhythm. What rituals work for you? What would you like to try, using what time, space, and other resources you currently have? Put them in the comments.